Guess what, Fire TV fans: the All-New Fire TV with 4K Ultra HD and Alexa Voice Remote was finally just released! 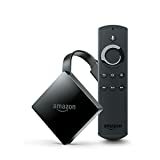 It might have only been unveiled a few weeks ago, but the wait has seemed like forever for Amazon’s new and improved Fire TV device. Apart from the addition of support for 4K ultra HD resolution and a faster processor, the device has also been shrunken down to a dongle form factor. Yup, that means no more unsightly boxes sitting on your media center. Instead, the new 4K Fire TV gets tucked away behind your television to work its magic while out of sight.